LONDON, England (CNN) -- British Prime Minister Gordon Brown issued a defiant response to calls for his resignation Friday saying he "will not walk away" despite heavy election losses and a raft of high profile resignations that forced a Cabinet reshuffle. 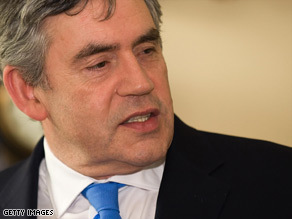 UK Prime Minister Gordon Brown has been rocked by numerous resignations recently. Brown said major gains by opposition Conservatives and Liberals in EU elections were a "painful defeat" for his ruling Labour Party, but his reshaped leadership would answer critics of his handling of the economic crisis and a scandal over politicians' expenses. "I accept my responsibility. I'm not going to walk away from my duty to the country," he told a news conference in 10 Downing Street. In an enforced reshuffle Friday, Brown promoted Alan Johnson -- the man tipped by many to succeed him if he is pushed out of office -- to the key role of Home Secretary. Johnson, who was Heatlh Secretary, takes the place of Jacqui Smith -- one of three Cabinet ministers who put pressure on the prime minister by resigning this week. It is, however, a sign of Brown's diminished authority that Alistair Darling has retained his position as chancellor of the exchequer, Brown's chief financial minister, despite a flurry of rumors suggesting Brown wanted to replace him with his close ally and former chief adviser Ed Balls. Two days earlier, Brown had refused to confirm that Darling would remain in his post when questioned by opposition leader David Cameron. In a normally unusual development, Foreign Secretary David Milliband had also said ahead of the reshuffle that he was unwilling to be moved. He has kept his job, as has veteran Justice Secretary Jack Straw. As Brown was piecing together a reshaped Cabinet, he suffered a further blow. Late on on Thursday night, James Purnell, the work and pensions secretary, resigned. He urged Brown to quit, saying it would give Labour a chance at winning the next election. In a scathing letter sent to members of the British news media, Purnell called on Brown himself to resign or face certain election defeat at the hands of the opposition Conservative Party led by David Cameron. Defense Secretary John Hutton has announced his resignation as well. But unlike Purnell, Hutton didn't accompany his departure with an assault on Brown's leadership. As the reshuffle continued, results were starting to come in from local government elections in Britain. These showed Brown's Labour Party, as expected, performing poorly and on course to lose the general election which has to be held by June of next year. A further blow is expected when results from European Parliament elections are announced late Sunday. All 27 EU member states are voting with 736 seats up for grabs. On Tuesday Home Secretary Jacqui Smith announced she would be standing down. Smith had become embroiled in the expenses row after listing her sister's London home as her main residence. In March her husband, who also works as her aide, was forced to issue a public apology after he admitted paying for adult movies with taxpayers' money. Purnell's direct challenge to Brown raises the question of how long the political career of the Labour Party prime minister will continue. Brown has vowed to fight on.